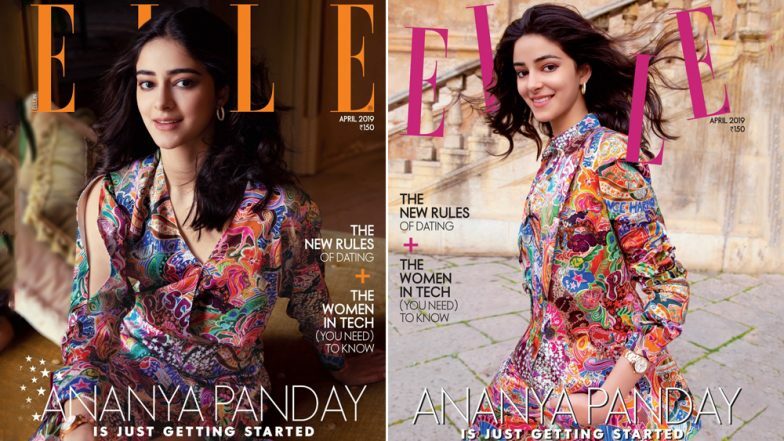 After Janhvi Kapoor sizzled on Vogue India and Sara Ali Khan picked Filmfare as her debut magazine cover, another raw talent, Ananya Panday is ready with her new offering. The Student of the Year 2 actress looks adorbs on her debut magazine photoshoot for Elle India and we can't stop rooting for this damsel. The issue that focusses on her new innings in Bollywood and how she's gearing up to prove herself sees Ananya as the girl-next-door sans any sultry pictures or sensuous looks. The idea was to present her the way she is - young, jolly and ambitious and we are glad for the team did a fab job in conveying all the right emotions. SOTY 2 Stars Tiger Shroff, Ananya Panday and Tara Sutaria Should Truly Turn 'Students' to Will Smith's Brilliant Moves on Radha (Watch Video). Dressed in Tommy Hilfiger's latest collection in collaboration with Zendaya, Ananya comes across as a fresh breath of air. The innocence in her eyes and that charming smile is sure to make guys go weak in their knees. With loose wavy hair, a pair of diamond studs and that infectious aura of energy, Ananya looks Bollywood ready and has the potential to be the next big star in B-town. Like Sara Ali Khan Even Bestie, Ananya Panday Will Have Two Releases in her Debut Year. The actress will foray into the world of entertainment with Karan Johar's Student of the Year 2. She also has the remake of Pati Patni Aur Wo with Kartik Aaryan and Bhumi Pednekar. Chunky Panday's darling daughter is already hitting the right notes and we see a bright future for her ahead. Here's raising a toast to this new addition and sending her loads of love and luck from the new beginnings. Student of the Year 2: Will Alia Bhatt and Tiger Shroff Dance Together in a Special Number?